Sebring, Fla., Mar. 16, 2017 – 24-year-old BMW sportscar driver Michael Johnson will make his first start at Sebring International Raceway in the IMSA Continental Tire SportsCar Challenge this week during round two of the 2017 racing season. 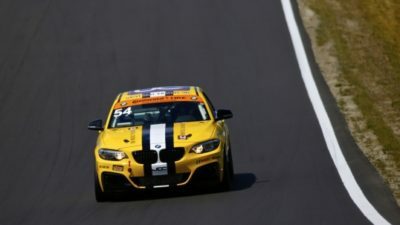 When Johnson made the jump from open-wheel racing to sportscar for the start of the 2016 season, he didn’t make his first Continental Tire SportsCar Challenge start until May at Mazda Raceway Laguna Seca, after sitting out the first two races of that season. For 2017, they plan to compete in all the series race events. The Continental Tire SportsCar Challenge opens for official practice at Sebring on Thurs., Mar. 16 at 9:50 a.m., which follows an open test which took place Wed. Two additional practice sessions will precede qualifications on Fri. morning at 8:30 a.m. The two-hour race will take place later that afternoon at 3:40 p.m. Johnson and Simpson are behind the wheel of the #54 BMW in the Street Turner (ST) class. All of the 2017 CTSC races will be televised on a tape-delayed basis by FOX Sports. However, it will be streamed, live, on IMSA.com and on IMSA's mobile app.